Vivah is a romantic Bollywood movie reminiscent of typical happy-go-lucky romantic movies from the Rajshri camp like Hum Aapke Hai Kaun and Hum Saath Saath Hain. It deserves much applause for re-creating a modern setting for the traditional values of engagement, arranged marriage, and family values. 3 Idiots Hindi Movie (2009), starring Aamir Khan, Madhavan, Sharman Joshi and Kareena Kapoor and directed by Rajkumar Hirani, was a superhit film of 2009 .and smashed many box office records on the way. The romantic Bollywood movie was reminiscent of the Hrishikesh Mukherjee school of film be packaging a social message into a commercially successful and viable film. 3 Idiots Hindi Movie (2009), with Aamir Khan and Kareena Kapoor in lead roles, was directed byRajkumar Hirani, a Bollywood trendsetter who gave us the Munnabhai Series. 3 Idiots, like his Munnabhai series packs a distinct punch by packaging a social message mixed with commercial elements. The songs are excellent and are not out of place, but instead move the story forward. Aamir Khan’s performance is mind blowing, as he effortlessly plays the role of a college going student, with his real age clearly hidden behind his reel age. The entire cast get equal screen time and the screenplay provides ample opportunity for the story to take honors, rather than any specific actor stealing the limelight. Vidhu Vinod Chopra is a very astute producer and he hits the right note with 3 Idiots which is considered one of the biggest blockbusters of all time in Indian cinema. 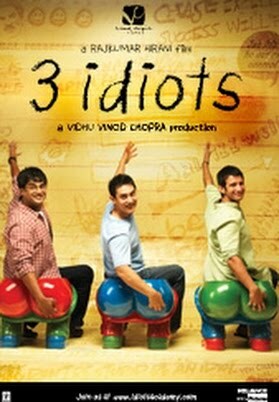 3 Idiots starts with 3 friends – Raju Rastogi and Farhan starting college at one of India’s most prestigious colleges. The peer pressure of having to perform and social pressure of having to conform to parents drives the 3 students to desperate methods of achieving success. The dean of the college (Virus) is bent on punishing them for questioning the system, while his daughter (Pia) is sympathetic to the trio and helps them in their journey of realizing their actual dreams as opposed to following what their parents prescribed. How thr trio manage to realize their individual career dreams in spite of their close friends and family ridiculing them forms the crux of the story. Aamir Khan easily gets under the skin of a college going student even though he is easily twice the age. His acting needs no introduction and the role is tailor made for him. Great dialogue delivery – he lives the role. Raju’s job interview is particularly very touching after the arduous experience he had to go through in obtaining permission for an interview. It is both emotional and very natural.